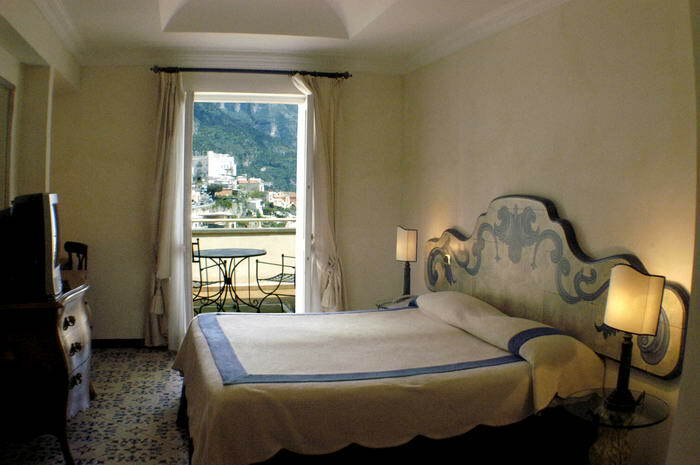 Positano Hotel Posa Posa, rooms: Superior, Royal and Junior Suites. Rooms are located on 6 different floors, with 2 elevators. 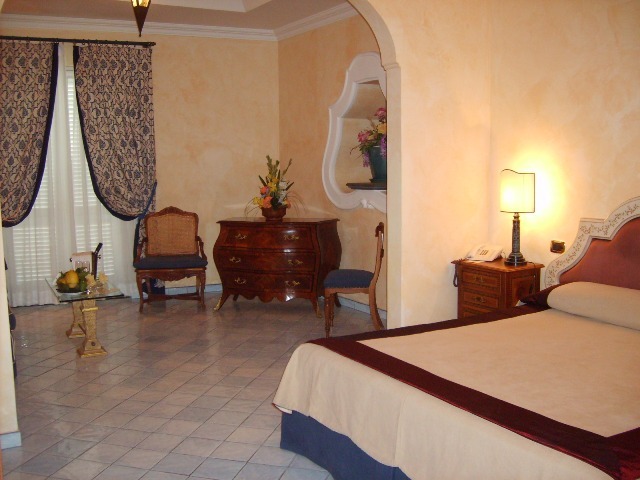 Each room and each bathroom are individually designed. 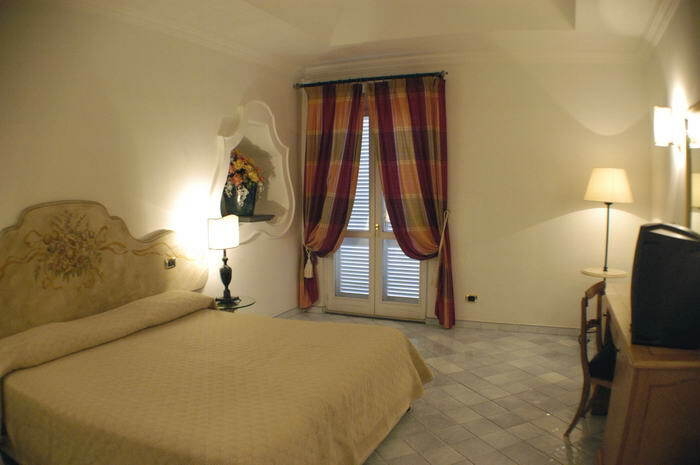 Rooms dècor is romantic and original, with old style furniture, classic Vietri hand-painted floor tiles, Mediterranean colours on white backgrounds. 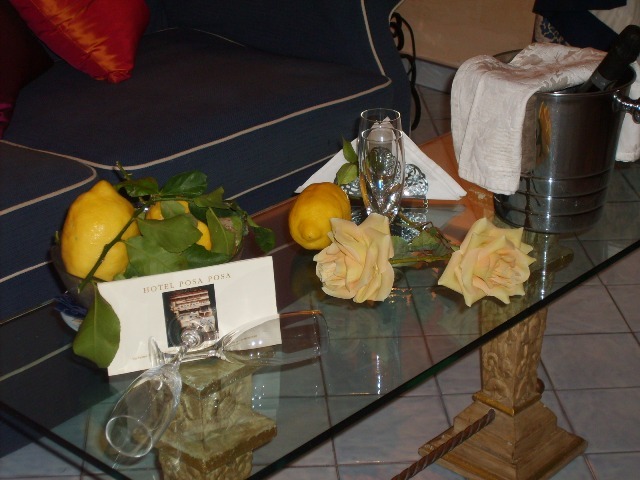 All the rooms, are equipped with air conditioning (heating), satellite TV multilingual, direct dial telephone, minibar, safe, private en-suite bathrooms with shower or jacuzzi and hairdryer. 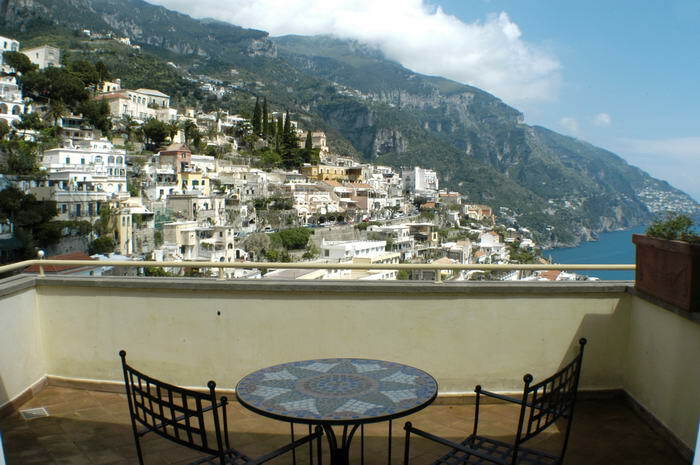 Most part of the room have balcony or terrace with view of Positano and the sea. 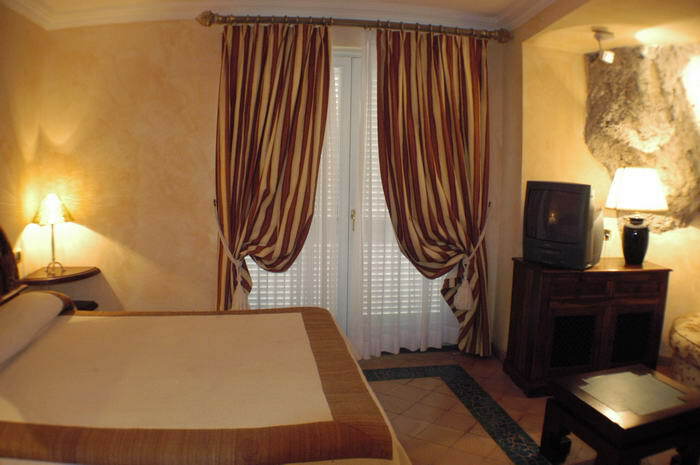 Some rooms are also suitable as triple room and Quadruple room. Double standard: room with double bed or twin beds, private en-suite bathroom with shower, satellite flat screen Tv multilingual, mini bar, personal in room safe, direct dial telephone, air/conditioning. 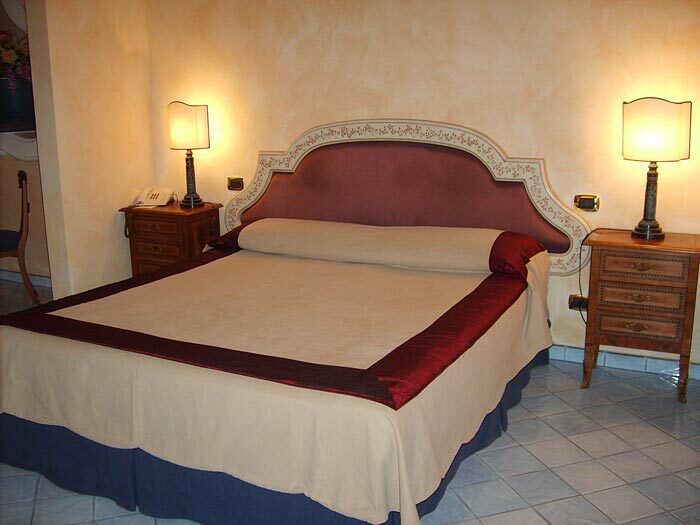 Double superior: room with double bed or twin beds, balcony with sea view, private en-suite bathroom with shower, satellite flat screen Tv multilingual, mini bar, personal in room safe, direct dial telephone, air/conditioning. 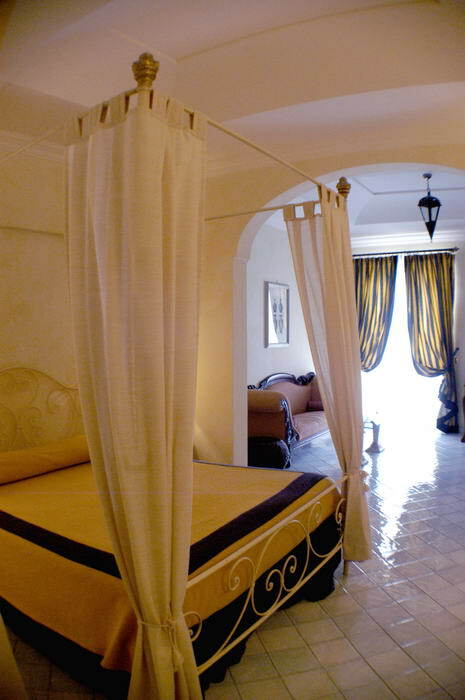 Junior suite: room with double bed or twin beds, balcony or terrace with sea view, private en-suite bathroom with Jacuzzi or shower, satellite flat screen Tv multilingual, mini bar, personal in room safe, direct dial telephone, air/conditioning. De-luxe Junior Suite: room with four poster double bed or king bed, sofa, balcony or terrace with sea view, private en-suite bathroom with Jacuzzi or shower, satellite flat screen Tv multilingual, mini bar, personal in room safe, direct dial telephone, air/conditioning. 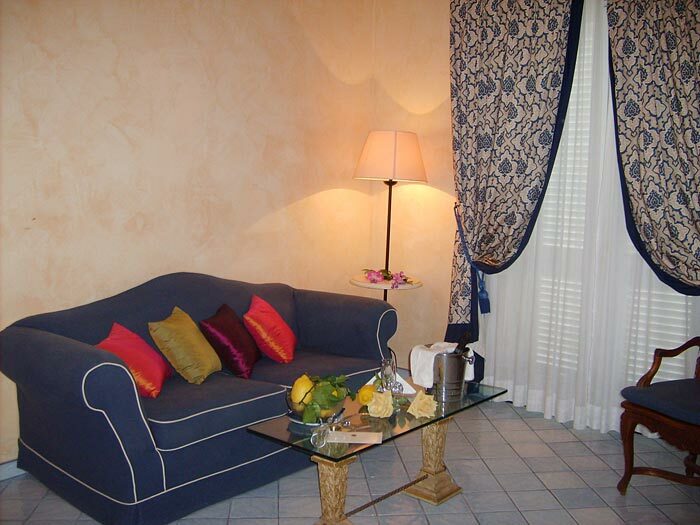 Corner Suite: room with King bed or twin beds, terrace with amazing view of the sea and the town, private en-suite bathroom with Jacuzzi or shower, satellite flat screen Tv with international channels, mini bar, personal in room safe, direct dial telephone, air/conditioning. 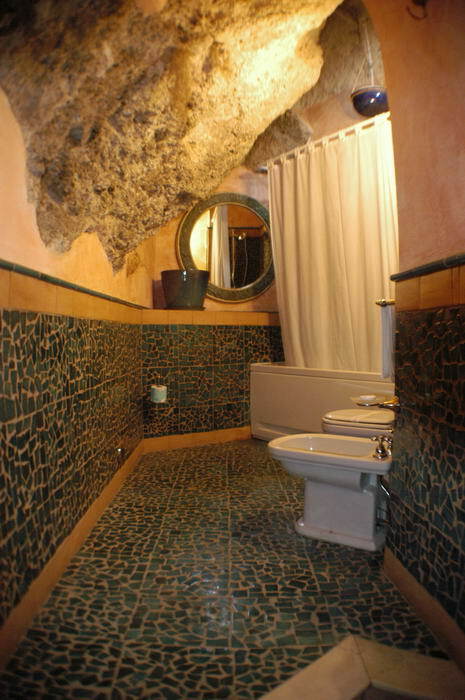 Suite on the rocks: room where part of the bedroom and part of the bathroom is built in the rock. The room have double bed, sofa, balcony or terrace with side sea view, private en-suite bathroom with Jacuzzi, satellite flat screen Tv multilingual, mini bar, personal in room safe, direct dial telephone, air/conditioning. 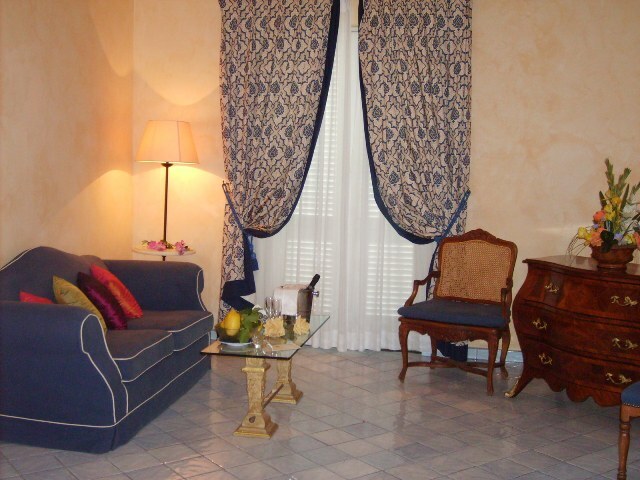 Triple room: with one double bed and one single bed or 3 single beds, balcony with sea view, private bathroom with Jacuzzi or shower, satellite flat screen Tv multilingual, mini bar, personal in room safe, direct dial telephone, air/conditioning. 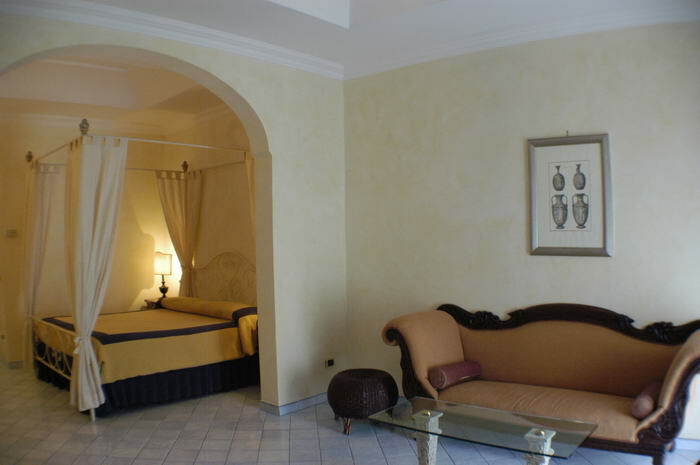 Quadruple room: with one double bed and two single beds or 4 single beds, balcony with sea view, private bathroom with Jacuzzi or shower, satellite flat screen Tv multilingual, mini bar, personal in room safe, direct dial telephone, air/conditioning.